Discover a way to perform Olympic Lifts without using massive amounts of tape. Not only do they provide full palm protection, these gloves protects every finger and thumb from rips and tares. They come with built-in velcro wrist support wraps for wrists protection. Excellent for Snatches, Clean and Jerks, Overhead squats, and any other lift and exercise where tape is needed to protect your hands. 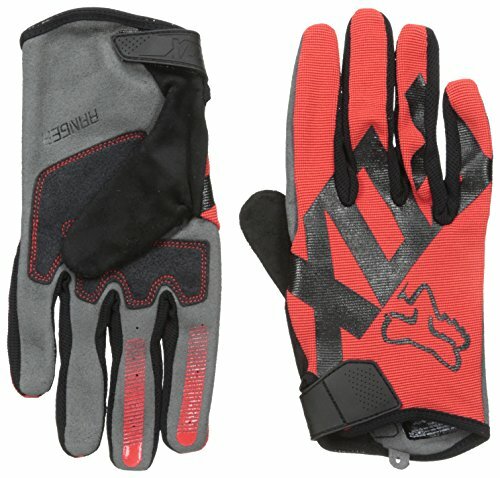 The open hand glove design lets your hands breathe, making them more comfortable lifting gloves. Also less bad smells while working out and when it's time to wash them, just toss them in the washing machine. BUILT-IN WRIST WRAPS * Experience these uniquely designed weightlifting wrist wraps that offers both men and women a superior training experience and superior wrist support with each and every work out. 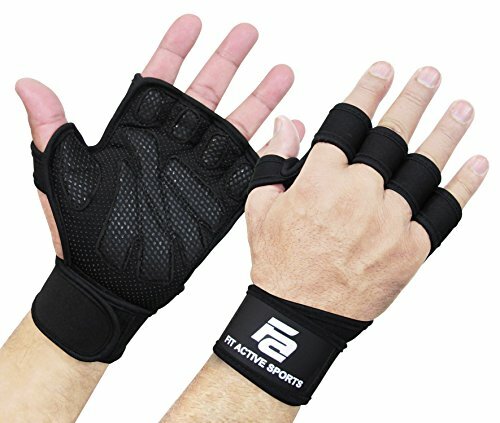 Excellent wrist support for performing cross training and Olympic lifts like snatches, clean and jerks, front squats, and other lifts requiring wrist protection. EXTRA TIGHT GRIP * Discover the one of a kind palm design of Silicon Printed Neoprene for extra grip on the barbell, pull up bar, muscle up rings, kettle bells, and more! Triple your work load with no rips, tares, or calluses. COMFORT * The Wrist Wraps are tightened and loosened with Velcro, providing the user the ability to adjust to their personal comfort. 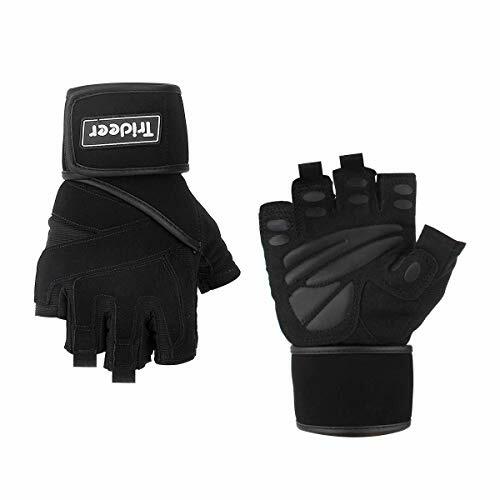 The well thought out open hand design also provides for extreme comfort, giving your hands the ability to breath while doing intense workouts. LESS SWEAT and MORE VENTILATION equals NO BAD SMELLING Gloves, less washes, thus longer lasting gloves. RIMSports' Workout Gloves are designed with you in mind! We know you need to support your wrists when lifting free weights, protect your hands while doing your forearm headstand, and comfortably fold your knuckles when delivering that hook punch - all while maintaining a sense of style. We get it! Our gloves are made from breathable material so your hands won't overheat, while the padding on the palm protects and helps to hold your grip. RIMSports' products are made to fit your lifestyle - we got you ladies! Full Palm Protection: No more torn hands and no more calluses. The Ihuan Workout Gloves protect your hands fully. The wrist support can protect your arms from spraining. And the foam pad on the palm will buffer the impact of sports apparatus. 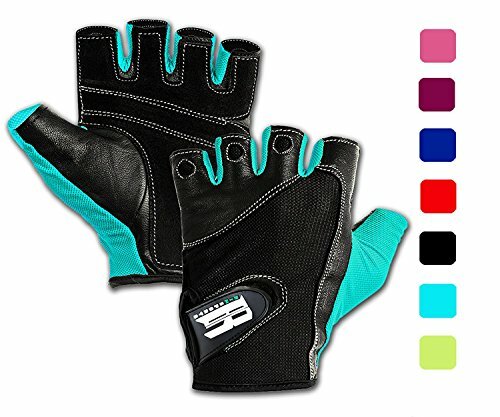 Made of Silicon Printed Neoprene, a high-quality material which is resistant to water, dangerous chemicals, oils, heat and aging making for a long last durable pair of gloves. Fewer RIPS AND TARES, MORE PEPS AND PR'S. Easy Workout: The Ihuan Workout Gloves are more breathable. The back of hands are made of Ultralight Microfiber which is a light and breathable fabric. So the gloves will keep your hands dry and comfortable. 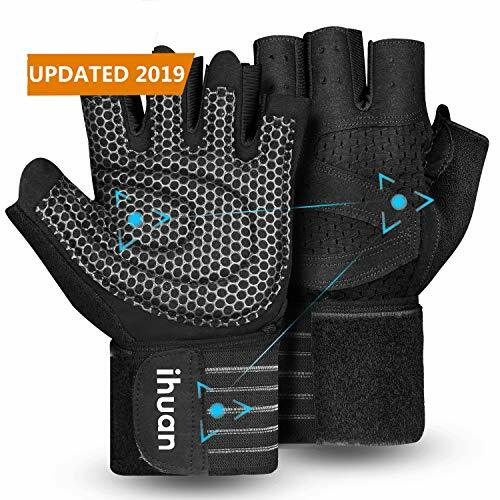 The Ihuan workout gloves are suitable for women, men, adults and teenagers to Weight Lifting, Pull Up, Exercise, Fitness, Gym Training and General Workouts. Built-in Wrist Wraps: Experience these uniquely designed weightlifting wrist wraps that offers both men and women a superior training experience and superior wrist support with each and every work out. 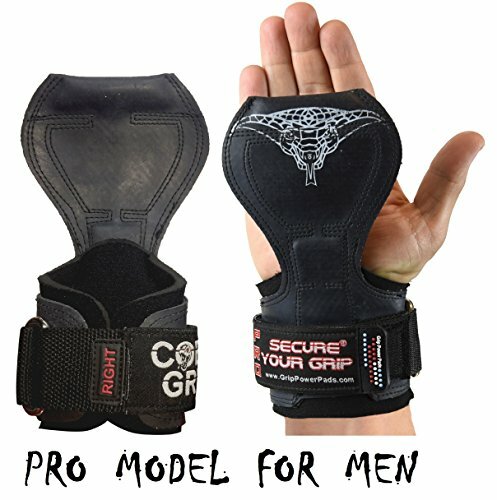 Excellent wrist support for performing cross training and Olympic lifts like snatches, clean and jerks, front squats, and other lifts requiring wrist protection. Comfort & Ventilated: The Wrist Wraps are tightened and loosened with Velcro, providing the user the ability to adjust to their personal comfort. 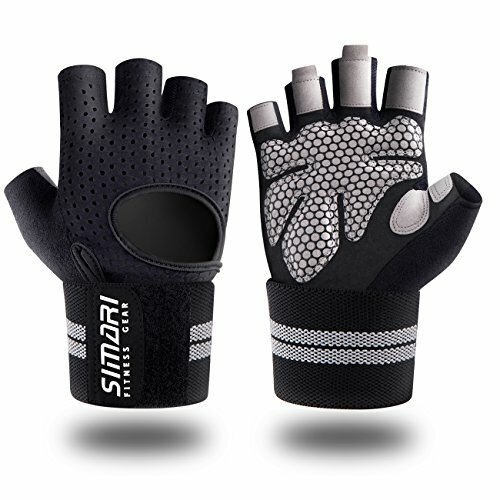 The well thought out open hand design also provides for extreme comfort, giving your hands the ability to breathe while doing intense workouts. LESS SWEAT and MORE VENTILATION equals NO BAD SMELLING Gloves, fewer washes, thus longer lasting gloves. Lifetime Money Back Guarantee: All Ihuan customers enjoy Lifetime Money Back Guarantee. Customers can return and get refunded in case the purchasing is not satisfactory for any reason. You have no risk to try. We promise you will get the high-quality products and service from Ihuan. 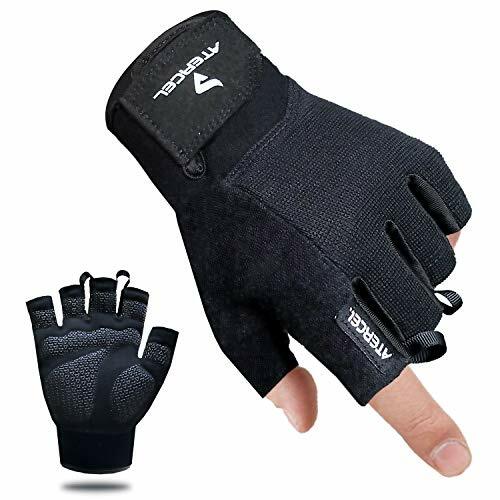 ALL-PURPOSE GLOVES: Adjustable strap for WRIST PROTECTION and PERFECT FIT.Suitable for Weight Lifting, Pull Up, Exercise, Fitness, Gym Training and General Workouts. SILICA GEL PALM for the BEST GRIP and effectively PROTECTING THE HAND FROM CALLUSES AND BRUISING. COMFORTABLE & EASY WORKOUT: Made with high quality ULTRALIGHT microfiber to allow for a comfortable workout, BREATHABLE mesh on the back keeps your hands dry. A pull buckle on the fingertip designed to make it easy take off . Measure the circumference of your palm (the widest part) and choose the right size below. Note: The gloves are snug-fit design, if you like to wear loose gloves, or you're between sizes, we suggest you choose the larger size. INNOVATIVE PALM DESIGN MAXIMIZES YOUR GRIP - We researched how hundreds of people use gloves to enhance our ergonomic design, leverage the muscle direction and placement and optimize grip functionality all to bring you a better glove. The result protects your hands from calluses, reduces friction discomfort all while still maintaining a strong grip on what you are holding onto. UNRIVALED COMFORT - Atercel gloves is made of lightweight, breathable and stretchy material, to increases flexibility, comfort and fit. 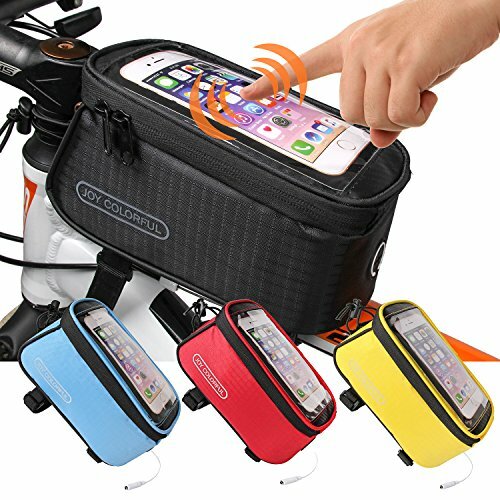 Ideal for general workout, exercise, gym training and cycling. SIZE FOR SUCCESS - This exercise gloves is snug-fit design, PLEASE CHOOSE THE CORRECT SIZE ACCORDING TO THE SIZE CHART (The last picture). We offer 5 different sizes for you to maximize effectiveness, perfect choice for both men and women. Slip your hands into the gloves and adjust the wraps for a personalized fit. 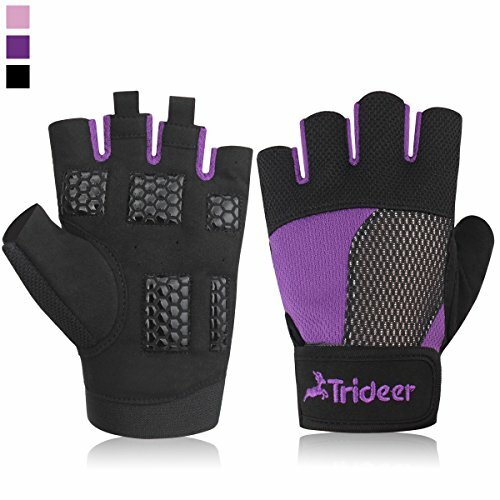 HUMANIZED DESIGN - Designed with a pull loop system for easy removal, a towelling panel on the back of the glove for wiping away sweat, and the soft mesh fabric inside fit the front of hand to keep your palm cool and dry all workout long. 100% SATISFACTION GUARANTEED - We're so confident you'll absolutely love our workout gloves that we'll exchange or refund NO QUESTIONS ASKED in the very unlikely event that you don't. So purchase now to bring your game to the next level. Product features include: QUICK REMOVAL FINGER TABS - Placed on the middle and ring finger, the tabs allow for quick removal of the gloves. Rather than dig around trying to get a grip on the glove, the tabs are easy to grip and make removing the gloves extremely easy. VENTED MESH - Mesh top is breathable and prevents heat buildup in the gloves which allows prolonged use even during the hardest workouts. GRIP-LOCK PADDING - Silicone rubber beading on the glove palm provides a high traction surface to grab a barbell, dumbbell, or other piece of equipment and hold it securely without losing grip. This provides a much better grip than traditional leather palm gloves. 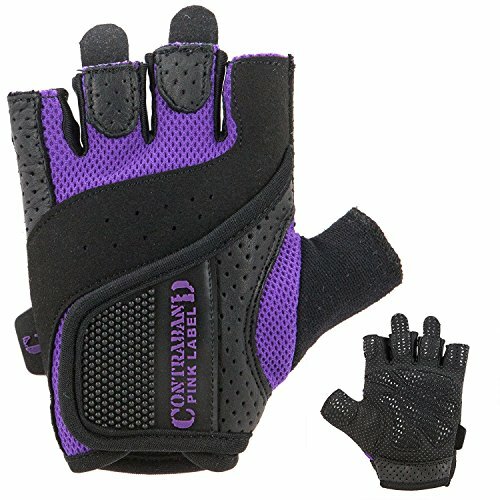 COMFORT SOFT INTERIOR - Glove interior is soft to provide comfort for extended use. The materials help to pull sweat from the hands and absorb in order to maintain a firm fit without slippage. NO HASSLE RETURNS AND WARRANTY - There is a full purchase price refund within 30 days of your purchase if you are not happy for any reason. After 30 days, there is a 1yr full replacement warranty on these gloves for any manufacturing defect. QUICK REMOVAL FINGER TABS - Placed on the middle and ring finger, the tabs allow for quick removal of the gloves. Rather than dig around trying to get a grip on the glove, the tabs are easy to grip and make removing the gloves extremely easy. VENTED MESH - Mesh top is breathable and prevents heat buildup in the gloves which allows prolonged use even during the hardest workouts. GRIP-LOCK PADDING - Silicone rubber beading on the glove palm provides a high traction surface to grab a barbell, dumbbell, or other piece of equipment and hold it securely without losing grip. This provides a much better grip than traditional leather palm gloves. COMFORT SOFT INTERIOR - Glove interior is soft to provide comfort for extended use. The materials help to pull sweat from the hands and absorb in order to maintain a firm fit without slippage. Comfortable, breathable fabrics. Made of soft and durable nylon and spandex. One-piece swimsuits for juniors girls and women Holiday. 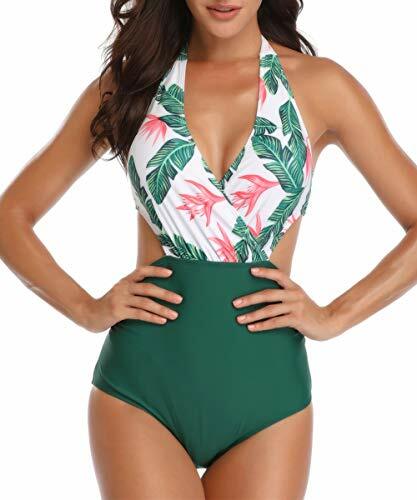 Deep V Neck and Push Up Padded bras halter swimwear with high waisted design. Surplice Neckline, adjustable straps can be tied closure at the neck and back, offering a comfortable fit meanwhile showing your beautiful back curve. Here is what you are looking for. Century Star swimwear is made of high quality material and brings you comfortable and soft feelings. Wear it, inspire Confidence and Beauty. Century Star is a brand registered in the USA, we devote to provide high quality product and better shopping service for each buyer, your satisfaction is our pure pursuit.